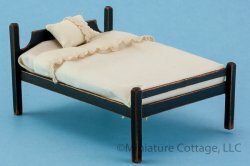 6 1/4" hand-roped wooden bed painted black with cream-colored mattress, sheets, and pillow. Signed by artisan BBE '93 Bearly Big Enough by Beers, Brian & Suzanne who specialize in hand-painted furniture. The artisans were featured in Nutshell News, Nov. 1992 issue.